Zimbabwe's President Robert Mugabe has criticised the UK, Australia and New Zealand for pursuing an "Anglo-Saxon unholy alliance" against him. These countries have led demands for action to be taken against him by the Commonwealth, which is holding its annual summit in Nigeria this week. Despite intense lobbying, Mr Mugabe was not invited to the meeting in Abuja. Zimbabwe was suspended from the Commonwealth after allegations of fraud during last year's elections. "We abhor the global high-handedness of the strong and powerful," he said in his annual state of the nation address to parliament. "Recent events in Iraq have clearly shown that a unipolar order that presently governs international relations is both unjust and unsustainable. 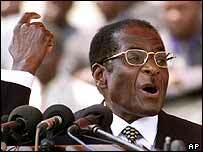 It is a source of conflict, and even of war," Mr Mugabe said. Mr Mugabe is said to be furious about his exclusion, and has threatened to pull Zimbabwe out of the grouping of former British colonies. He says the "white section" of the Commonwealth holds a grudge against him due to his policy of seizing white-owned farms for redistribution to landless blacks. The speech came just two days before the start of his party's annual congress, but Zanu-PF officials have ruled out any chance of the 79-year-old leader stepping down. The party congress is likely to be dominated by discussions over the economic crisis in the country and on the government's controversial land reform programme. Some 3,000 Zanu-PF delegates are expected to attend this week's conference in Masvingo, some 300 kilometres south of the capital, Harare. The party will be buoyed by a by-election win at the weekend in Kadoma, south-west of the Harare. which had been won by the opposition in 2002. In Harare, the treason trial of opposition leader, Morgan Tsvangirai - who is accused of plotting to eliminate President Mugabe - has resumed after a four-month recess. A lawyer representing the state, Joseph Musakwa, said the prosecution wanted to include discussion on transitional arrangements and military support after the proposed assassination. But defence lawyers immediately opposed the application, arguing that the amendments were tantamount to putting Mr Tsvangirai on trial on different charges, which they said cannot be done in mid-trial. Mr Tsvangirai denies the charges against him.